In order to provide the best vaccination program for your horse, we like to follow the American Association of Equine Practitioners (AAEP) guidelines. Vaccinations can be divided into two main groups; core vaccines and risk-based vaccines. Core vaccinations protect against diseases that are endemic to a region, are virulent/ highly contagious, pose a risk of severe disease, those having potential public health significance, and/or are required by law. Core vaccines are recommended for all horses. Risk-based vaccines are selected for use based on risk assessment. Use of these vaccines may vary between individuals, populations, and/or geographic regions. 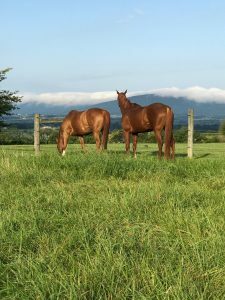 The staff at South Mountain Equine can help determine what risk-based vaccines are necessary to keep your horse protected. For additional vaccination information, visit the AAEP website.